It may be the end of the summer holidays but it’s not the end of the cycling season. Far from it in fact, with more great Sky Ride Local bike rides coming up and a chance to see the world’s cycling stars in our county when the Tour of Britain Race comes to Cumbria this month. So the weekend is nearly here, and you can make it a great one by getting out on your bike and enjoying some time on two wheels. This Sunday we have a particularly lovely Sky Ride Local for you. 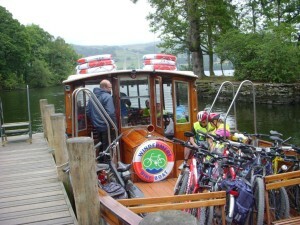 Starting at 2pm from Brockhole, the Lake District Visitor Centre, you’ll be transported across Lake Windermere on the Bike Boat to the quiet and peaceful west shore of the Lake. Your boat ticket is included in the free ride. 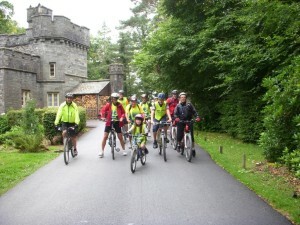 Our British Cycling ride leaders will guide you along one of our most popular Sky Ride Local routes, taking in the impressive Wray Castle and meandering along the west shore path with its excellent surfaces, designed with cyclists in mind. You’ll cycle through lush woodland and along the lake shore, before heading back to catch the return boat to Brockhole. At 6 miles, this is an easygoing ride on a quiet track, perfect for building your cycling confidence away from the hustle and bustle. To book your free place on this ride visit www.goskyride.com/Lakes or sign up at Brockhole. You can bring your own bike, or hire a bike from Brockhole, telephone 015394 46601 prior to the ride to book your bike. On Monday 16th September Cumbria will be the focus of the world’s cycling media and fans, as the Tour of Britain race brings some of the world’s very best riders and teams to our county. The cyclists will race along a spectacular route from Carlisle through the Lake District to the notorious uphill finish of Beast Banks in Kendal. Taking in Cockermouth, Workington and Whitehaven, heading through the Western Fells, ascending the formidable Honister Pass and racing through Keswick and Ambleside (to name but a few locations on the route), the Tour of Britain will be a sporting spectacle not to be missed. To celebrate the Tour of Britain coming to Cumbria we’re holding a special Sky Ride Local ride starting from Kendal Town Hall at 11.15am on Monday 16th September. The ride is an 11 mile loop along quiet country roads, with views of the river and the hills. We’ll have a mid-point breather and refreshment stop at Staveley Mill Yard, home of Wheelbase bike shop and Wilf’s café, before completing our circular route back to Kendal. This ride is perfect for anybody wanting to get out on their bike for a pleasant ride at a relaxing and steady pace. We won’t ride as fast as the professionals but we will certainly soak up the atmosphere of the day! We’ll be back in Kendal with plenty of time to get a great spot to see the finish of the Tour of Britain stage. Places on this special ride are limited so book early to avoid disappointment! Visit www.goskyride.com/Lakes to book.